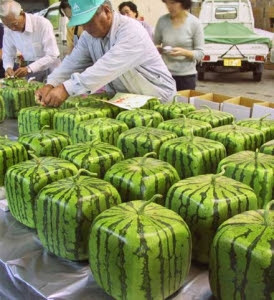 The square shape is designed to make the melons easier to stack and store. They sell for double the price of regular watermelons! The square shape is designed to make the paint easier to stack and store. They sell for double the price of regular paint cans! The new swirl is designed to make the can look cooler and hip. They sell for the same price of regular cans! A new logo won’t change the way your business operates. A new logo will never be considered a game-changer or even put your business into the hearts of customers. However, thinking outside of the box to create something worth talking about will differentiate you from competitors. It will allow you to stand out and be seen as not only an innovator but also a trail blazer. A new logo can spark a short term spike in price but that’s not going to last. If the products value isn’t improving than you will only be able to hold the wool over your clients eyes for so long. Thus, unless you’ve got money to burn, a business model that is thriving or a horrible logo right now. Your logo should be one of the last things on your mind. What matters right now is whether or not you have a business model that can scale or at least meet your definition for success. When was the last time you bought a product because it had a cool logo?